Disney has been doing a fair amount of tinkering with its transportation-related offerings, with some of those changes having far-reaching impact. That means it’s time for an update of our Magical Express FAQ – the place for all things Magical Express: who it’s for, how to use it, and most importantly, should you use it. Buckle up, folks, it’s a long ride. Disney’s Magical Express is a free bus service that takes Walt Disney World hotel guests to and from Orlando International Airport. Who can use Disney’s Magical Express? While this has not yet been officially announced, we are nearly certain that when the Riviera Resort opens in 2019, it will also have access to Magical Express buses. But I’m staying at the Swan! Isn’t that on Disney property? Don’t I qualify for Magical Express? Sorry, no. While the Swan, Dolphin, Shades of Green, and a few Disney Springs-area hotels are quite close to the action, only guests staying at the hotels actually owned by Disney qualify for free Magical Express transportation. If you’re considering staying at the Swan/Dolphin/etc., you may want to factor the lack of Magical Express service into your decision process. The lack of ME means that staying at these resorts will automatically add a rental car fee (and sometimes hotel parking fees) or cab/shuttle/Uber fare to the cost of your vacation. I’m flying into Sanford Airport. Can I get Magical Express from there? No, there is only free Magical Express transportation from Orlando International (MCO). If you’re flying into Sanford, Tampa, or another airport, you’ll need to arrange alternate transportation. How do I set up my Magical Express ride? When you make your Disney hotel reservation, you will be asked if you want to use Magical Express. You’ll find the request form in the booking check-out process–look for the phrase “Add Ground” if you don’t see Magical Express. The form will ask you whether you want Magical Express from MCO to your hotel, from your hotel, or both ways. If, for example, you were going from the airport to WDW for a few days, and then to a Disney cruise, you might be going from the port terminal to MCO rather than from WDW to MCO. In this example, you’d choose just the “To My Disney Resort Hotel” option. Or if you’ve used a travel agent to make your hotel reservation, you can ask her or him to reserve your Magical Express service. In order to request Magical Express service, you’ll need to have your flight information available. What if I don’t know my flight information yet? No worries. This is me 75% of the time I go to Disney World. I often make my hotel reservations a year in advance, but don’t book my flight until much closer to the travel date. 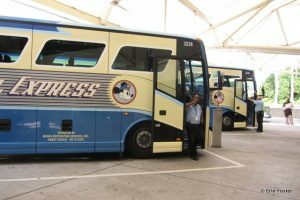 Magical Express can be arranged at any point prior to your trip by visiting the WDW Airport Transportation Page or by calling 866-599-0951 or 407-939-1936 in the United States and Canada. You may also be able to make Magical Express Reservations through the Disney Vacation Club if you are a DVC member. Whichever method you use, you should, however, be aware that in order to have Magical Express luggage tags mailed to you (more on what those are in a sec), you’ll need to make your ME reservation at least two weeks in advance. I booked my Disney stay through a travel aggregator (Orbitz, Expedia, Travelocity, etc.) that never asked me if I wanted to use Magical Express. Can I still use it? Yes. As long as you have a reservation at a Disney hotel on the list above, then you can use ME. Use the WDW Airport Transportation page or call 866-599-0951 to set this up. Have your resort confirmation number and flight information available when you call. Please note that sometimes the Disney hotel reservation number and your Orbitz/Expedia/Travelocity/etc. confirmation number are not the same. You may need to contact your sales agent to get the correct Disney reservation number. What do I do if my flight information changes after I’ve given the information to Magical Express? If the airline has tinkered with your arrival/departure time by a few minutes, don’t worry about it. If there has been a substantial change, then call Magical Express to let them know. You should also do this if anything happens at the last minute, such as a significant weather delay or you miss your flight. If you’re in a tizzy at the airport (status quo for me) and forget to call to update Magical Express about a delay, don’t stress. Just get to Orlando, and they’ll work with you at the Magical Express Welcome Desk to get you to your resort as quickly as possible. What happens if I’m doing a “split stay” at two different Disney hotels? No problem. If you’re making your Magical Express booking when making your room reservation, just choose “to my Disney Resort hotel” for the first half of your stay, and “from my Disney Resort hotel” for the second half of your stay. Alternatively, you can call Magical Express and explain your situation. They’ll be happy to help. Will I get anything in the mail about my Magical Express booking? If you reside in the United States and make your Magical Express booking more than a few weeks in advance, then you will get an envelope in the mail that contains yellow Magical Express luggage tags. In a separate mailing, you will receive your MagicBands. If you reside outside the United States, you may have to pick up your MagicBands upon arrival at WDW. In many countries, you will be mailed an envelope containing a paper Magical Express voucher which you can use at the airport. What are the luggage tags for? The luggage tags are sturdy sticker paper and look much like an airline bag tag, but yellow. They are the tracking mechanism Disney uses to send your luggage directly from Orlando International Airport to your Walt Disney World hotel. If you choose to put the yellow tags on your bags, you will do this at your home airport. When the bags arrive in Orlando, they will be pulled out of the regular plane baggage behind the scenes. Instead of being placed on the carousel at MCO baggage claim, they will be routed onto a truck headed to WDW. When using the yellow luggage tags, you can head directly from your plane to the Magical Express pick-up point without stopping at baggage claim. What are the MagicBands for? MagicBands have many functions (see above link for more info). In this situation, they function as your Magical Express ticket. 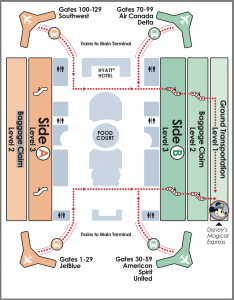 When you arrive at the Magical Express area at the airport, Disney cast members will scan your MagicBand and point you to the correct bus waiting area. Remember to wear your MagicBand or to keep it in your hand luggage. Don’t pack it in luggage that’s tagged to go to WDW without you. Ack! I accidentally packed my MagicBand/voucher into my checked luggage. Stay calm. There are lots of friendly folks at the Magical Express desk. If you don’t have your MagicBand for any reason (you lost them, you arranged for ME service on short notice, etc. ), just let them know at the desk. They can look up your room reservation and print you a paper vouchers for the trip to your hotel. Assuming that there’s no line at the desk (and there rarely is), this only takes two or three minutes. Wait, it’s worse. I accidentally left my MagicBands at home on my kitchen table. If you don’t have access to your MagicBands when you arrive at your hotel, stop by the front desk and explain the situation. You’ll either be issued new MagicBands or a plastic card (your choice) which you can use to get into your room, into the parks, etc. I only have carry-on bags. Do I need the yellow luggage tags? Nope. Feel free to toss them in the trash. They also make a festive alternative to tape when wrapping packages. I will have checked luggage. Do I have to use the yellow tags? No, you don’t have to. It’s your choice of whether you want Disney to deliver them directly to your hotel room for you, or if want to pick up your bags yourself and take them with you on the bus. Disney only sent me one yellow luggage tag, but I have two bags. What do I do? Call Magical Express, and they’ll mail you another one. If I use the yellow tags and have Disney deliver my luggage, how long will it take to get my bags? Disney states that bags are typically delivered in three hours. 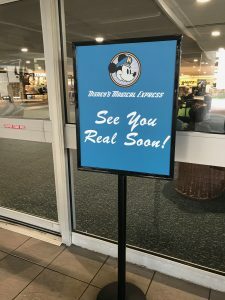 This is often interpreted by guests to mean “three hours after your plane lands at MCO,” leaving Magical Express users frustrated by lack of access to their luggage. However, the real scoop is that bags are supposed to be delivered within three hours after you check in at the hotel. In reality it may take even longer than that for your bags to make their way to your room. Anecdotal evidence suggests that waits of up to five hours after resort arrival are not atypical. If you’re adults arriving in the morning and heading straight to the parks, you might not even notice this time lag. If you’re arriving at night with small children, not having access to your luggage could be a minor disaster. Thus, if you plan to have Disney deliver your bags to your room, you should be sure to stock your carry-on items with anything you might need for the better part of day. This may mean a change of clothes, toiletries, and baby gear. You should always keep medications, electronics, and trip documentation (including MagicBands) with you in your carry-ons. Suitcase with yellow Magical Express tag. 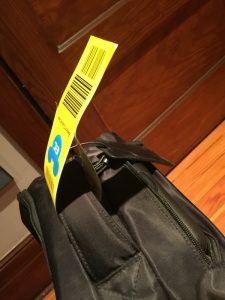 Crazy question … How exactly do I put the yellow tag onto my bag? Have your suitcase ready nearby. Place the tag on a flat surface with the yellow side down, white side up. Unpeel just the top 3 inches of protective paper. (Where it says “Peel Off This Portion Only,” that’s the bit you want to remove from the adhesive.) Do this on both ends, so you have a small exposed adhesive rectangle on both ends with a long strip in the middle still covered with paper. Carefully slide the tag through the luggage handle, being careful not to touch the luggage with the exposed adhesive. Fold the tag in half so that the two exposed adhesive rectangles stick together. What’s the advantage of having Disney deliver my bags to my hotel? Depending on your plans, this can save you some time. In my many trips to MCO, I’ve often waited 20 minutes or more for my bags to come off the carousel. If you have Disney deliver your bags, you save this 20 minute wait. Also, having Disney deliver your bags saves you quite a bit of shlepping. You don’t have to maneuver luggage through crowded terminals or hotel lobbies yourself; someone behind the scenes is doing this for you. If you’ve got young kids and are trying to push a stroller in addition to carting luggage, or if you’ve got medical issues or mobility problems, using the Magical Express luggage delivery service can be a real lifesaver. Are there disadvantages of having Disney deliver my bags to my hotel? Well, you’re adding another step to the process — another opportunity for your luggage to get misdirected or lost. Magical Express delivery is typically quite reliable, but the more people that handle your bags (at the airport, at the hotel), the more chance there is that something will go wrong. I’ve decided I’d rather not wait for Disney to deliver my bags. (Or I don’t trust Magical Express to deliver my bags.) What do I do? You’re always welcome to bring your bags with you on the bus to your resort. In this case, do NOT put the yellow tags on your bags. If the airport baggage handlers see the yellow tags, they will pull them for sorting behind the scenes. With yellow tags, your bags will never make it out to the pick-up carousel at baggage claim. Once you’ve grabbed your bags yourself from the luggage carousel at baggage claim (as you would at any other airport), wheel them with you over to the Magical Express check-in area. I made my Disney booking at the last minute and there was no time for Disney to send me luggage tags. What do I do? Honestly, the easiest thing is for you to retrieve your bags at the airport luggage carousel yourself and bring them with you to the Magical Express bus. The WDW website states that you can just leave your bags, go to the ME desk and describe your bags, and they’ll find them and bring them to the hotel for you. I’ve heard it works, but the entire concept just makes me nervous. I’m flying to Orlando from outside the USA. Does that impact my ability to use Magical Express? Anyone staying at a WDW hotel listed above is eligible to use the free bus service to get to/from MCO, regardless of their country of origin. However, international travelers have some different rules for their luggage than guests originating from U.S. destinations. In my opinion, if you’re an international traveler, you’re much better off just bringing your bags with you on the Magical Express bus, since you’ll have them in your possession already. Map of Orlando International with Magical Express location noted. Where is the Magical Express check-in area? Magical Express is on Level 1, below the B side baggage claim area. Follow the signs to baggage claim B, then take the elevator or escalator down. Follow the signs from there. If you’re going directly to Magical Express from your flight, or if you’re collecting your own bags from Baggage Claim B, then you’re in good shape. If you’re collecting your own bags from Baggage Claim A, then you’ll have to go back to the main terminal and cross over to the B side. How do I know which baggage claim area I’ll be in? The Baggage Claim A airlines are: Aer Lingus, AeroMexico, Air Transat, Alaska, Avianca, Azul, Caribbean, Copa, Emirates, Frontier, Gol, JetBlue, MagniCharters, Miami Air, Norwegian, Southwest, SunWing, Swift Air, Virgin Atlantic, Virgin America, and WestJet. The Baggage Claim B airlines are: Air Canada, American, Bahamasair, British Airways, Delta, Icelandair, LAN, Lufthansa, Silver Airways, Spirit, Sun Country, TAM, Thomas Cook, United, and Volaris. Your airline terminal position may impact whether you collect your checked luggage yourself or have Disney deliver it to your hotel, particularly if you’re traveling with small children or family members with mobility issues. Are there costs involved with having my luggage delivered? There is no charge to have Disney deliver your luggage to the hotel. Having Disney deliver your luggage will probably save you a few dollars over bringing your bags onto the bus yourself. If you’ve read our post on Disney Tipping Norms, you’ll know that you should tip a few dollars to anyone who assists you with handling your luggage in your presence. It’s a near certainty that your bus driver will help with putting your bags under the bus and getting them out, so you’ll want to tip him or her. Strangely you may actually save a few bucks if you let Disney provide the service to you of delivering your bags to your room directly, since it’s quite possible that you won’t be in your room when your bags arrive, thus you won’t have anyone to tip. Does Magical Express have specific hours? The Magical Express buses run 24 hours a day, 365 days a year. Whatever time you arrive at MCO, there will be a bus to take you to your hotel. This applies to flights that are running on time and to those that arrive late due to weather or other delays. While the bus service runs all day, the luggage delivery service does not. If your flight arrives before 5:00 a.m. or after 10:00 p.m., because it was scheduled to do so or because of a delay, then you must collect your luggage from the carousel on your own and bring them with you to the Magical Express check-in desk. OK, I’ve made it to the Magical Express check-in area. What do I do? Step up to any of the Magical Express podiums (podia?). If you have your MagicBand, you’ll scan it at the podium and a cast member will direct you to the proper queue for the bus to your resort. Every member of your party over the age of two will have their MagicBand scanned at the podium; have them all ready before you approach. If you don’t have a MagicBand, have your resort confirmation number ready. The cast member at the podium will look up your reservation and issue you a paper voucher for the bus. How long will I be waiting for the bus? In my experience, the wait could be anything from nothing to about 20 minutes. It depends on when the last bus left for your resort area. OK, my bus is ready. What do I do with my bags? Just give whatever bags you have, checked or large carry-on, to the driver, and he or she will load them under the bus for you. What’s the inside of the bus like? These are coach-style buses. The seats are plush velour, with armrests and footrests, two by two down the aisle. The buses now have seatbelts at every seat. Is there entertainment on the bus? Once you get off airport grounds, a propaganda video will play on the overhead TV monitors. It’s fairly innocuous, showing you many of the activities available at Walt Disney World. Expect Disney fans to cheer when their favorite attractions appears on screen. For some families this is the start of their vacation, almost like their first ride. If you have little kids, the bus video may seem less boring than a ride in a rental car. I have a small child. Do I need a car seat? No. Florida law does not require car seats on buses, nor is there any mechanism to attach a car seat to the bus seat. Your baby can sit on the seat next to you or on your lap. If you happen to have a car seat with you, your driver will stow it underneath with the luggage. I’m uncomfortable not having my child in a car seat. What do I do? If this is a sticking point with you, then you may want to consider alternate transportation to your resort. Yes, most Magical Express buses do have a small lavatory at the rear of the vehicle. It’s not luxe, but it works in an emergency. Is the Magical Express bus handicapped accessible? Guests traveling in wheelchairs can be accommodated. This service must be requested in advance. Can I bring my dog with me on the Magical Express bus? Only service animals are allowed on board. I want to rent a car (or take an Uber) for my trip to the hotel, but I’d like to save time by having Disney deliver my bags to my room. Can I do this? Unfortunately not. This is called a “luggage only transfer” and it is not allowed. Members of my party are flying to Orlando on several flights arriving at different times. Can we use Magical Express? Yes. Make sure their names are on your room reservation and that you give ME their flight information. There’s no need for you to travel all together. Each person can take a bus independently upon arrival. I want to start my fun right away. Can Magical Express drop me at a theme park rather than my hotel? Nope. They’ll only drop you at your resort. If you want to go directly from the airport to a theme park, you should rent a car or take a cab, car service, or Uber/Lyft. But I really, really, really want to start my fun right away. Can Magical Express drop me at a theme park rather than my hotel? Pretty please? Again, no. They’ll only drop you at your resort. If you want to go directly from the airport to a theme park, you should rent a car or take a cab, car service, or Uber/Lyft. I’m going from Orlando International to Port Canaveral for a Disney Cruise Line trip. Can I use Magical Express? No. Magical Express is only for transportation to the Walt Disney World resort hotels. Disney does have a bus transportation option from MCO to Port Canaveral, but this is fee-based service (currently $35 per person each way). Arrange this through Disney Cruise Line or your travel agent. Members of my party are arriving on different days. Can they be accommodated on Magical Express? Probably, just call ME and let them know what you need. I’ve had WDW trips several times where my husband either arrived a few days after me or left a few days before me (pesky business meetings). In every case, ME had no problem putting him on a bus. I’m arriving in Orlando several days before my Disney room reservation starts. We’re renting a car and going to the beach. After I return the car back at the airport, can I take Magical Express to my resort? The Magical Express paperwork states, “Complimentary transportation services provided by Disney’s Magical Express are associated with a Walt Disney World room reservation and include a one way ground transfer between the Orlando International Airport and your Disney hotel on the day that you check in and a one-way ground transfer from your Disney hotel to the Orlando International Airport on the day you check out.” You’ll note that there is no language here about a need to FLY to the Airport. As long as you’re going to your resort on your check-in day, then it really doesn’t matter how you got to the airport itself. However, Magical Express does want to know approximately what time you’ll need transportation, so they can make sure to have enough buses available. The only real mechanism they have to note is is via a flight number. Since you’re driving to the airport, you won’t have a flight number. This may fluster some ME reservationists. A good workaround is to find a flight that arrives at approximately the time you want to go to your hotel. Simply give that flight number to the reservationist as a placeholder. You could also just show up at the Magical Express desk and ask for a ride. I’ve done this myself at least half a dozen times for various reasons. As long as you have a valid Disney resort reservation number, they’ll transport you. So it’s OK if I forget to make Magical Express reservations? It’s better if you can make reservations for your trip from MCO to WDW, but it’s really not a disaster if you forget. As long as you have a WDW hotel reservation, they get you there from the airport. But don’t expect to do this for your return from WDW to MCO. If you don’t have a Magical Express reservation in that direction, the bus won’t even know to pick you up. You must make a reservation to get back to the airport. I’m on the Magical Express bus. How long will it take me to get to my hotel? The actual ride from the airport to Disney property takes about half an hour. Each ME bus may transport guests from the airport to three or four different hotels. So, if your hotel is the first stop, then it will take about 35 minutes to get from the airport to the resort once you’re on the road. If you’re the fourth stop, then it may take up to about 75 minutes once you leave the airport. That seems like a long time. Would it be any faster if I rented a car or took a cab/ride share? Well, there are waits involved with those forms of transportation too, but yes, you might save a few minutes if you skipped ME. On the other hand, Magical Express is free. There are costs associated with other forms of transportation. We’ve generally heard of Ubers in the $35 and up range each way. Cabs and car services are typically $50 and up each way. Rates may depend on the size of the vehicle you need, the number of people in your party, holiday or weather surge pricing, and other factors. Again, Magical Express is free. Other forms of transportation are not. 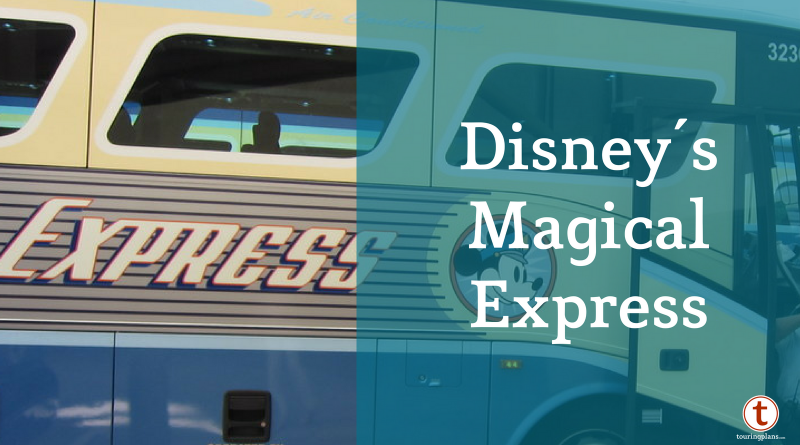 How is Magical Express related to other forms of transportation at Walt Disney World? Magical Express only refers to the bus service from the airport to Walt Disney World hotels. It is only available to guests staying at the hotels owned by Disney. In addition to Magical Express, there is an extensive system of transportation to move visitors within Walt Disney World, between the theme parks, water parks, hotels, and shopping/dining areas. This system is available at no cost to anyone visiting any part of Walt Disney World, you don’t have to be staying at any particular hotel to use it. The Disney transportation system includes buses, boats, trams, monorails, and soon a new Skyliner Gondola system. None of the “on campus” transportation is related to Magical Express. You can use any of the Disney transport buses/boats/monorails/trams/gondolas regardless of whether you use Magical Express. Additionally, some of the non-Disney-owned hotels that don’t participate in Magical Express, notably the Swan & Dolphin, are active participants in the free on-site transportation. You can get a free Disney bus from the Swan to the Magic Kingdom (for example), you just can’t use Magical Express to get from the airport to the Swan. 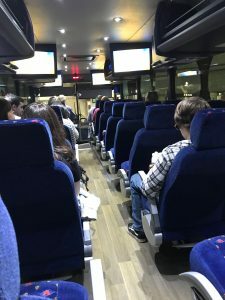 Will using Magical Express and not having a car at Walt Disney World have any impact on my vacation? If you ask 10 people, you’re going to get 10 completely different answers about this. I used to be VERY anti-car rental. Now I’m more in the “it depends on where you’re staying” camp. If you’re staying at the Grand Floridian and will be spending most of your time at the Magic Kingdom and Epcot, you won’t need a car. If you’re staying at a Saratoga Springs treehouse and you’ve got small kids, you’ll almost certainly be more comfortable with your own vehicle. Will having a car make my Walt Disney World vacation better? As with most Disney questions, the answer is, “It depends.” If you’re only ever going directly from a Disney hotel to a Disney theme park, using the free transportation system within Disney World might be perfectly fine for you. Are there any disadvantages to having a car at Walt Disney World? Well, there didn’t used to be. But in early 2018 Disney began charging resort guests a daily parking fee. This applies if you’re driving to WDW from home with your own car, or if you’re renting a car in Florida. Ugh. This makes using Magical Express and skipping the airport car rental even more appealing now. If I use Magical Express and skip renting a car, am I stuck at the mercy of the Walt Disney World transportation service once I get to WDW? The good news is that the number of transportation options have vastly increased in the past few years. In addition to the old stalwart taxis, Uber and Lyft rides are readily available in the Disney area. And Disney itself is getting in the game with its authorized Minnie Van service. If you take Magical Express to your hotel and forego a car rental, your vacation may be substantially improved if you budget for a few internal cab or Uber/Lyft rides while you’re at Walt Disney World, particularly if you’ll be dining at hotels that are not your own. Rides within WDW typically cost between $15-25, depending on how far you’re going. Even if you take several rideshare trips during your stay, the overall cost could be substantially less than car rental, gas, tolls, and that pesky resort parking fee. Should I tip my Magical Express driver? There are signs at the front of most Magical Express buses that state that drivers are allowed to accept tips. Tips are not mandatory, but if the driver is assisting you with luggage, then a dollar or two per bag is customary. What’s the process for taking Magical Express home? How do I know when/where to get the bus? The day before you depart, you’ll get a note either on your room door handle or under your door telling you what time the Magical Express bus will pick you up. The pick up spot is always right out side the hotel main entrance. The note you will receive includes a bar code that will function as your bus ticket/voucher. Do I need this paper voucher? Won’t my MagicBand work for the trip home? Not currently. Right now the bus drivers have no mechanism to read MagicBands, so you will need your paper voucher for the ride home. If you’ve misplaced your paper voucher, stop by the concierge desk at your hotel and they can probably print you another one. I never got a paper voucher for my Magical Express trip home. What do I do? Stop by the concierge desk at your hotel as soon as you realize you’re missing your voucher. They will help you with the paperwork. Is there any way to know further in advance what time my bus will be leaving? For domestic flights, Magical Express pickup is generally about three hours prior to your flight departure time. This may be four hours in advance for international flights. If you’d like to know the exact time of your ME bus, you can call ME directly or stop by the concierge desk at your resort, and they’ll be happy to let you know. Wait, I thought these times were different. From time to time, Disney has tinkered with the timing of Magical Express pickups. 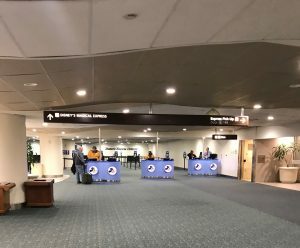 At one point when there was some major construction happening at Orlando International, ME pickup for domestic flights was four hours in advance. Always double check. I want to get in the most park time possible. Can Magical Express pick me up at a theme park? No, sorry. Magical Express will only pick you up at your own hotel. Can they pick me up from another resort? Again, no. Magical Express pick-up is only from your own hotel. Members of my party are taking different flights home. Can we be accommodated on Magical Express? Generally yes. As I mentioned, there have been several times when my husband has left our vacation a few days early or left earlier in the day than the rest of the family. Magical Express was always able to accommodate him. Give Magical Express a call to explain your situation and they will be likely to help. My flight is at the crack of dawn. Can I really use Magical Express to get to the airport? Yes, really. My parents once had a 6:00 a.m. departure from MCO. The Magical Express bus picked them up at their hotel at 3:00 a.m. I am still glad that I wasn’t on the flight with them. My flight is late in the evening. Check out time is at 11:00 a.m. I’d like to go enjoy some more time in the parks, but what do I do with my bags? You have two options here. First, if you only have carry-on luggage, you can leave everything will the Bell Services desk at your hotel. They will tag your bags, give you a receipt, and then store your luggage in a secure location. Return to your hotel about 15 minutes before your scheduled Magical Express pick-up time, hand the clerk at the desk your receipt, and you’ll have your bags back in a jiffy. Is this really secure? I have my laptop in there. If you tell the Bell desk that you have valuables in your luggage, they will put it in an even more securely locked compartment. However, I will tell you that I have given my bags to Bell Services for storage many dozens of times, even with unzippered bags containing cameras, laptops, and iPads. I’ve never had a problem with anything going missing. Perhaps I’m just a trusting soul, but I feel like my bags are quite safe with Bell Services. I have lots of luggage that I’m planning to check during my flight. Do I leave that with Bell Services too? You can if you’d like to. Under this scenario, you’ll pick up your bags a few minutes before your ME departure. Then when the bus arrives, the driver will store them under the bus for your trip to the airport. At the airport, you’ll unload them and bring them yourself to the airline check-in desk. That seems complicated. Any alternatives? It’s actually not too complicated, but it does involve lots of carting your stuff around. If you’d prefer not to do this, there is an alternative called Resort Airline Check-In. Resort Airline Check-In? What’s that? Basically think of this as airport curbside check-in, but it’s right at your hotel. Bring your bags to RAC, and they will tag them with your airline’s bag tag and deliver them directly to your airport and then to the plane. You drop your bags here, and you won’t see them again until you claim them at your destination airport. Sounds scary, does it work? Yes! Yes! Yes! This is wonderful service. I’ve used it many times myself without a hitch. You don’t even have to be using Magical Express to take advantage of Resort Airline Check-In. Even if you’re driving to the airport, this is a way to get your bags there without you having to carry them. RAC will even print you out a boarding pass. This allows you to proceed directly to your gate. Yay! So everyone can use Resort Airline Check-In? Not every airline participates in this service. Currently (Summer 2018) the approved airlines are: Alaska Airlines, American Airlines, Delta (domestic US only), JetBlue, Southwest, and United. This list changes with some regularity. You may want to stop by early during your visit to confirm that your airline participates. If you are traveling internationally or if your airline does not participate, you can leave all your luggage with Bell Services, and they’ll store it for you until it’s time to leave. Does Resort Airline Check-In have specific hours? Yes, RAC is generally open from 5:00 a.m. until noon. (Note that this is time change, previously RAC had been open until 1:00 p.m.) Bags must be dropped at RAC no earlier than 12 hours prior to your flight and no later than 3 hours prior to your flight. This means that guests booked on flights departing prior to 8:00 a.m. may not use Resort Airline Check-In. My airline has a checked luggage fee. How do I pay that? Most airlines allow you to pay baggage fees online. If you know your airline has fees that apply to you, you should use the payment method on the airline website. Anything else I should know about Resort Airline Check-In? Resort Airline Check-In functions much like check-in at the airport. They’ll be checking government issued photo IDs (generally a driver’s license or passport) for all adult travelers. Everyone in your flying party must be present at the RAC desk before they will accept their bags. OK, I’ve got the idea now, but I’d like you to break it down for me. What are the good points about using Magical Express? The biggest item in the Magical Express pro column is that it’s free. It’s also easy to use and quite reliable. Well, it may take you a bit more time getting to and from the airport than it would if you were transporting yourself. And you’ll almost certainly end up leaving WDW earlier than you otherwise might if you were driving yourself. Also, once you’re “on campus” at Walt Disney World, you’re stuck there without a car. For many guests, this will not matter, but others who want to visit other area attractions or go shopping off site, this can be an issue. If you’re using Magical Express but want to visit other area attractions, be sure to build Uber/Lyft or cab fares into your budget. But once you’re at WDW without a car, it’s likely that you will be at least a bit at the mercy of the internal Disney transportation system, which has many pros and cons of its own to consider. You could also rent a car for just a day or two mid-trip. There are Avis and National car rental desks at the Dolphin hotel (an easy walk from Epcot and Disney’s Hollywood Studios) and the Disney Car Center (near the Magic Kingdom, accessible via shuttle from most area hotels), as well as other rental company desks at some the Disney Springs area hotels. But again, you’ll obviously be spending money if you’re renting a car, both on the car rental and on any overnight parking at your WDW hotel. What’s your personal thinking on Magical Express. Do you use it? As with all Disney questions, the answer is, “It depends.” It depends on what rental car rates are, who I’m traveling with, where I’m staying at WDW, how long I’ll be there, what else I’m doing on my vacation, and a host of other factors. But yes, I do often use Magical Express and have been favorably impressed with the service. What are your thoughts on using Magical Express? Have they changed since Disney instituted the resort parking fee? Let us know in the comments below. Erin – Seriously, this is the best FAQ I’ve ever read on any topic! Incredibly thorough, very detailed, and every scenario was covered. Great work!! Thanks so much! You totally made my day. Great information! The only thing I’d suggest is sliding your yellow tag through the handle before removing the protective backing. One clarification. If you are flying from Canada you can still use the luggage tags and have Disney take your luggage directly. No need to pick up once arriving at Orlando airport. I just called Disney to make sure. Unfortunately, Canada is deemed “international” in some cases with Disney and not in other circumstances. This depends on which airport in Canada you are flying from. Most of the big airports have US “pre-customs”, which basically means you go through US immigration and customs in the Canadian airport. The flight arrives in the domestic terminal in the US. However, small airports are standard international flights. This is all good info. I will update the post accordingly. Thanks. Wow! This sounds incredibly frustrating. Thanks for info. Adding to the “should I rent a car” decision…We used MDE and we’re staying at Boardwalk. We rented a car for 1 day and my husband drove to the grocery. He got us snacks and breakfast food for the week and returned the car later the same. I think the car rental was about $15. Well worth it! That’s an unusually good price for a rental car. You got lucky! Actually, if you don’t receive luggage tags, you will just give your baggage claim checks to the Cast Member at the Magical Express check in desk and they will have your luggage pulled and delivered. It’s generally not a problem. Excellent post. And while luggage only transport it not allowed, a couple of suggestions. (1) It only takes one person from your traveling party to make ME trip not a luggage only trip. So, if you one of your six members takes the ME, the others can UBER straight to the park. (2) There is no rule (or at least any mechanism for enforcement) that says you must ride all the way from MCO to your resort. If all your bags are yellow tagged, you can simply get off on the first ME stop on property — regardless of resort — and jump a bus to the park of your choosing. Much better option than being the 4th stop on the ME delivery route and waiting for 3 other groups to load and unload. Both of these are EXCELLENT points, and should probably be added to the FAQ proper so they don’t get forgotten down here in comment-land. This are great tips. Thanks for the input. One important comment on the Resort Airline Check In and Checked Bags – unless things have changed, do NOT pay for the bag directly with the airline. It needs to be paid directly to the group handling resort airline check in (ie call the number listed). I did that once, and was not able to leave my bag with Resort Airline Check In, as they couldn’t access the information about the bag being paid. Note that if you get a free checked bag (ie through status), that’s never been an issue for me. I’m surprised you had this issue. I’ve paid for my bags myself several times and never had an issue with RAC. And last April I took a group of 12 to WDW. Some had free bags, some paid online with the airline, and some used the RAC phone number. None of us had any problems. Perhaps procedures have changed. I’m glad to hear that things have changed on that front, it was a while ago. Interesting that they didn’t update the official FAQ on that front.